Posted August 7, 2018 & filed under Accolades, Applications Guides, Blog, Hydrology, Technical Bulletins. 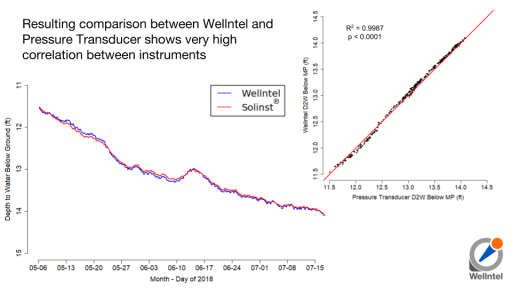 In a side-by-side comparison with a combination pressure transducer and barometric pressure logger, Wellntel has shown that with proper calibration and “benchmarking,” Wellntel will deliver accuracy and precision on par with much more expensive and complicated instruments. 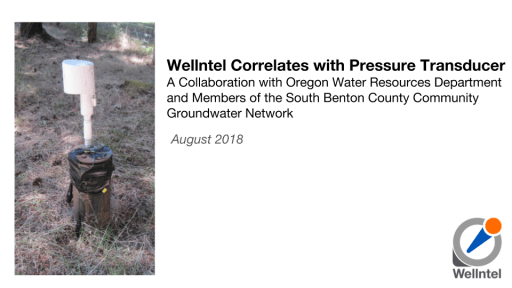 Here are the results of a three-month study conducted by members of the South Benton County Community Groundwater Network, the Oregon Water Resources Department and the Wellntel Science Team. Posted June 22, 2018 & filed under Blog, News. This press release was issued by a creative and hard-working group of Oregonians. We’re honored to be working with them. June 11, 2018. Monroe, Oregon. Concerns about groundwater availability and development pressure in rural South Benton County have spurred local residents to form a community groundwater monitoring network to study local groundwater resources and possibly impact policies governing rural housing development. At present, the 14- member group called the South Benton Community Groundwater Network (SBCGN), is a “citizen science” project using well-monitoring equipment designed for domestic pumping wells to gather a range of data on groundwater levels and fluctuations – such as static water levels, pumping impact, and well recovery rates after water draw downs. Gathering such data is possible through emerging technologies that monitor wells less invasively and more economically than prior technologies. 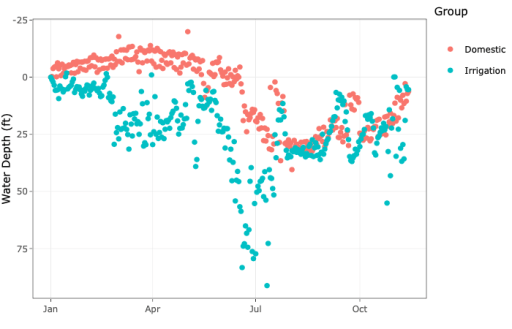 The new technology enables network members to view fluctuations and seasonal trends of their own well and the whole network in real time. New members are currently being sought to join this voluntary network. The Oregon Water Resources Department (OWRD) has actively participated throughout the establishment of the community groundwater network. Through a series of community meetings, the OWRD has helped local residents understand geologic and hydrologic conditions making groundwater scarcity an issue for many of the area’s residents. Meanwhile, the department continues to validate the groundwater data from the new technology, which it began testing locally nearly two years ago. 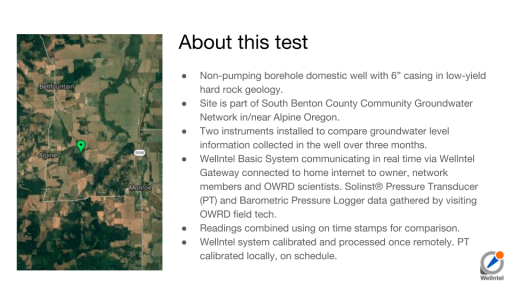 The number of local failed and low-producing wells resulted in growing concerns for rural South Benton County residents who depend on domestic wells. Rural home owners have few options and little recourse when their domestic wells fail or falter. 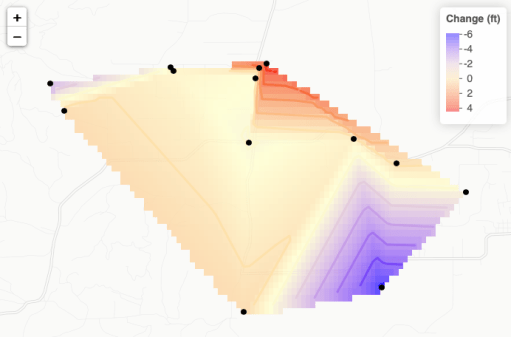 Residents with concerns about the productivity of their wells need data to provide the basis for water-management decisions. The South Benton Community Groundwater Network is a unique, community-led, citizen science endeavor. Unlike the growing number of groundwater-monitoring networks in the nation, SBCGN has no sponsoring agency and members have each purchased compatible well-monitoring technology that easily enables data sharing. Posted May 29, 2018 & filed under Accolades, News. Milwaukee (May 29, 2018) – Wellntel is excited to announce a first-time investment from Clean Energy Trust. 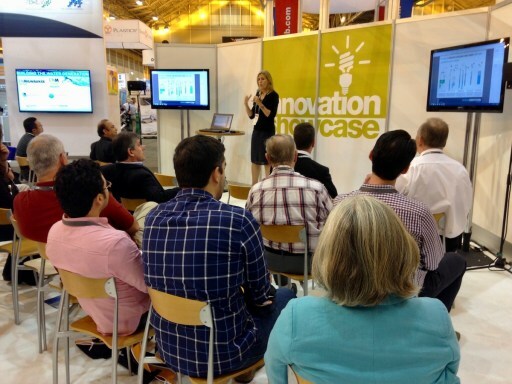 Clean Energy Trust invests in innovative cleantech startups from the Midwest. The investment was announced at Clean Energy Trust’s #Co_InvestCleantech event in Chicago, Illinois on March 23, 2018. Wellntel was selected from over one hundred applicants and joins 27 clean tech companies and the 3 additional 2018 investments in Clean Energy Trust’s portfolio. The CET investment in Wellntel recognizes that groundwater – a shared but historically invisible resource – is directly linked to vital systems like food and energy production, economic development and energy efficiency and will help Wellntel to reach its vision: to Make Groundwater Visible. Clean Energy Trust believes in the importance of entrepreneurship to combat the effects of climate change, revitalize economic opportunity, and enable both high-impact and attractive financial returns. “Clean Energy Trust is excited to be investing in Wellntel and sees enormous potential in creating a data network of groundwater information to enable smarter business and policy decisions.” – Paul Seidler, Director of Venture Development. Over 60% of Clean Energy Trust’s investment have female or minority founders. Wellntel was pleased to receive the “ComEd Female Founder” Award which includes an additional $20K over CET’s initial investment. 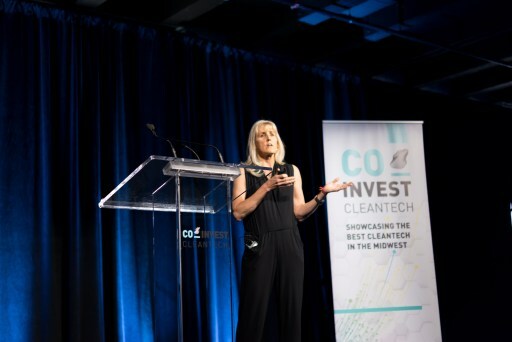 Wellntel CEO Marian Singer presents at #coinvestcleantech. Wellntel was started by Marian Singer and Nicholas Hayes in 2013, was commercially launched in 2015, and today, has customers in more than 30 states. 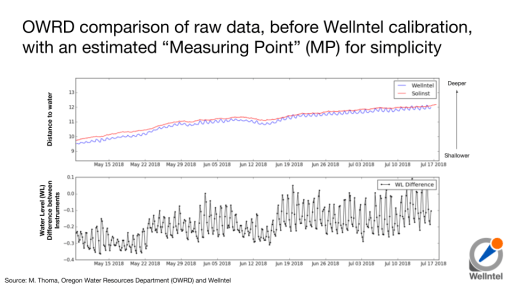 Wellntel is the only Groundwater Information System suitable for use on domestic and irrigation wells, delivering verifiably accurate model-ready time series groundwater level data including static, pump-influenced and recovery rate information. Since the system is cloud-based, data are highly secure, near-realtime and can be shared broadly or kept private, based on well owner preference. Wellntel’s cloud-based information system is making groundwater visible, actionable and sustainable. Posted April 3, 2018 & filed under Blog, Hydrology. It was once thought that groundwater monitoring would be the exclusive purview of government scientists, agencies and regulators. Wellntel upends that premise by enlisting, teaching and enabling citizens and community groups to themselves become collectors of groundwater data. We’ve seen that businesses are as interested as citizens and communities in sustainability, and need groundwater facts to meet their profit goals, their goals for shareholder value, and to demonstrate corporate citizenship. It is not surprising that businesses would build or sponsor groundwater monitoring. Consider that a 2014 study showed that S&P 500 companies that have built sustainability into their core strategies outperform those that haven’t. On the ground, and through new customers and projects, we see that businesses must understand the natural resource condition in regions where they operate or invest, and, more specifically, make smarter operating decisions based on facts about groundwater supply and health. A water-intensive business with a portfolio of operating locations, can, for example, shift production to where resources are known to be abundant and renewable, and, then, become stewards to ensure that they will remain that way. A mine operator in Wisconsin has built a groundwater-monitoring network on neighborhood wells ringing the mine and then reports on pumping impacts and recovery metrics in a quarterly review with local leaders and citizens. 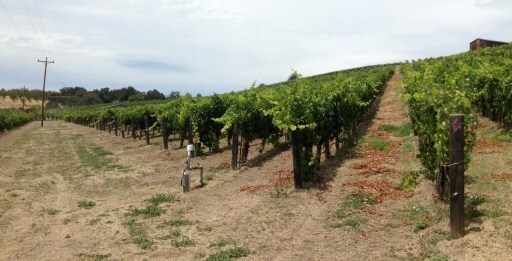 A California vineyard keeps a close watch on local annual recharge and makes seasonal decisions about pumping, storage and irrigation schedules. A growing concentrated livestock operation is enlisting neighbors to collect groundwater level data to establish a baseline against which new water demand is compared and managed. In each case, a business, as a local and global corporate citizen, works to ensure the long-term health of the water supply. With Wellntel’s innovative turnkey Network Subscription offer, a business can stand up within weeks or even days a large scale and dense groundwater-monitoring network that is highly secure, and not be burdened with the purchase or management of equipment or new IT systems. Through this industry leading offer, the business customer will receive actionable and accurate data ready for use in reports, for sustainability metrics and assessments, and for investor and management communications. Call 844-935-5426 or email info@wellntel.com for network pricing. Posted March 29, 2018 & filed under Events. Wellntel will provide an invited presentation at the Annual Texas Groundwater Conference hosted by the American Ground Water Trust. The conference – titled Everything Aquifers and Groundwater Management – is co-sponsored by the Texas Water Development Board. Chuck’s presentation will happen during session 6, between 1:40 and 3:40 pm, June 7th. If you are involved in Texas groundwater issues or have interest in the innovative programs of the American Ground Water Trust and the Texas Water Development Board, consider attending and learning more about Wellntel. Posted March 20, 2018 & filed under Events. You’re invited to learn about a new community-oriented groundwater monitoring program that aims to cover the state of New Mexico, especially engaging rural participants like farmers, ranchers, well owners and municipalities. Recent years have seen water shortages in communities across New Mexico, from Magdalena to Questa to Wagon Mound to Clovis. New Mexico currently lacks sufficient groundwater level measurements for many regions of the state—we have no way to map or track how much groundwater we have or the health of the aquifer. The New Mexico Bureau of Geology & Mineral Resources has begun a project to create a statewide collaborative groundwater monitoring network, with the Museum of Natural History and Science as one of many monitoring locations and an important educational outlet. Celebrate the beginning of this essential collaborative project. 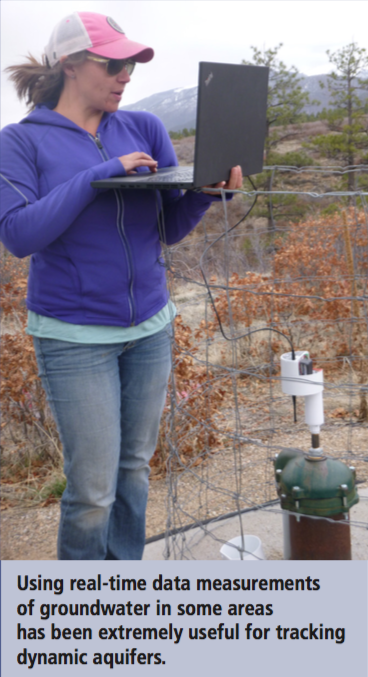 Come learn more about groundwater in New Mexico, and try out one of our new well monitoring stations! Where: New Mexico Museum of Natural History, Albuquerque, NM Kiwanis Learning Garden. This outreach location is a collaboration between: New Mexico Bureau of Geology & Mineral Resources, New Mexico Tech, New Mexico Museum of Natural History and Science, Kiwanis Club, Rodgers Drilling, and Wellntel. Posted February 21, 2018 & filed under News. 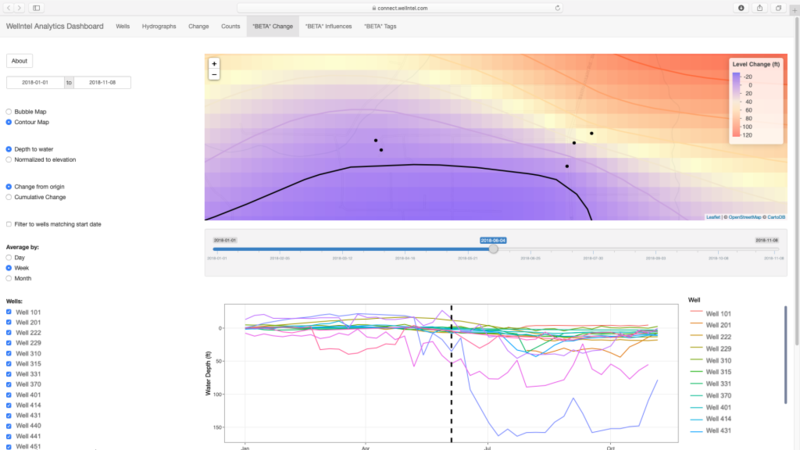 Wellntel’s New Pump Influence Tagging enables easy and fast exclusion or inclusion of pump influenced groundwater levels in a dataset. The powerful new feature comes standard on all systems leaving Wellntel’s Wisconsin factory as of March 1st, 2018, and is backwards compatible with all customer systems running Sensor Firmware 2.0 or higher. With a Pump Performance Kit installed on a well with a pump, any Wellntel system will take readings on the programmed time interval (default is once every 4 hours), but if the pump is running when the reading is taken, the reading will be tagged “Pump Influenced”, and if the pump is not running, the reading will be tagged “Timed.” All Hydrographs on dashboards will include Pump Influence readings by default, but customers can choose to exclude Pump Influenced readings when the “Static” radio button is selected, and data exported from these charts will include or exclude readings as selected. 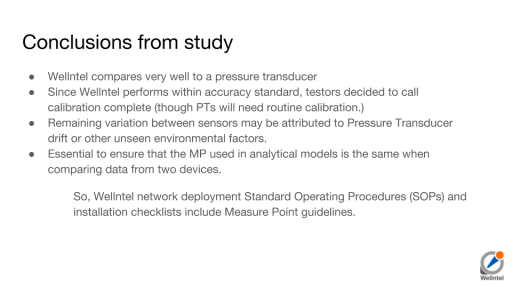 Pump influence exclusion is a common practice among groundwater scientists and water managers, who often value trends more than up-to-the-minute operating conditions. However, with the ability to tag these and other local conditions (like pump start, stop and recovery) Wellntel offers new possibilities and insights. 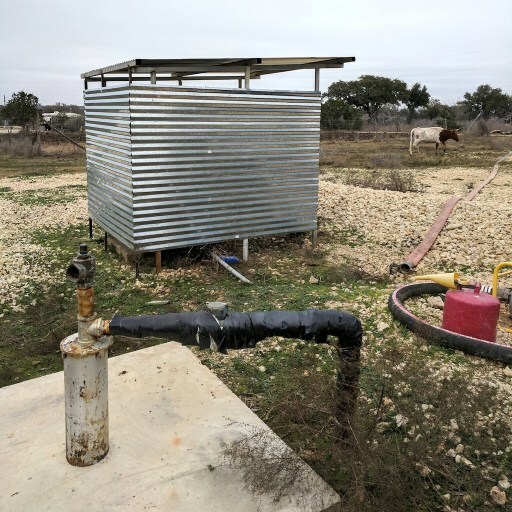 With the power to collect and then choose to either include or exclude these data when it makes sense, owners and network sponsors gain deeper understanding of a well and the groundwater source it draws from. 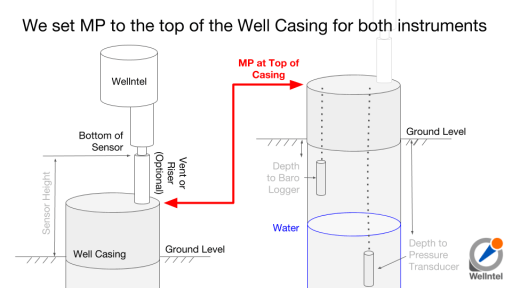 With the addition of Pump Influence tagging in Basic and +Pump Systems, Wellntel now offers five ways of viewing pumping activity in the context of groundwater levels in a well, depending on the type of system that you have. Wellntel Basic now includes Pump Influence Tagging. The following sample hydrography compare the five modes. 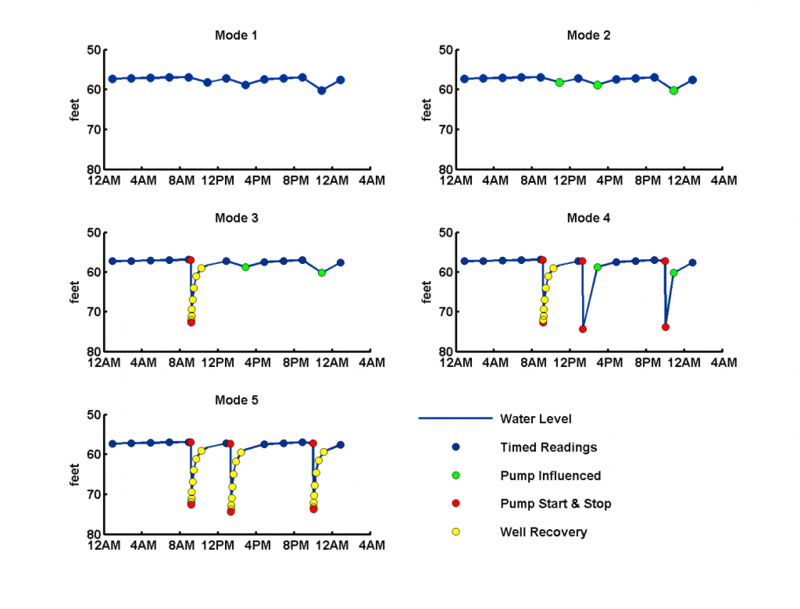 Customers with Basic Systems gain insights into pumping activity, not available before. Data flow from +Pump systems can be streamlined while still providing insights into pump duty, speeding dashboard performance, extending solar ride-through periods and enabling battery-powering, need be. 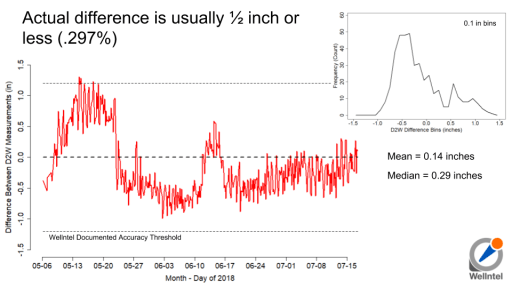 Systems on predictable time intervals stay running longer, with less attention from owners, compared with systems that must track unpredictable rapid-fire pumping events. 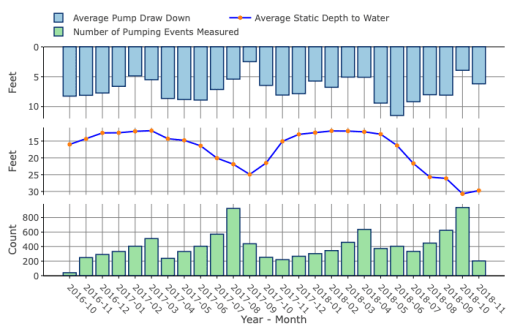 Customers with +Pump systems and constant pressure pumps can ignore rapid start/stop patterns that provide little useful information and focus on groundwater levels and trends. For most well owners and network members, Timed Readings with Pump Influence Tagging will be more than enough, so this is the factory default setting in a Basic system. Some Wellntel owners, like farms and mine operators running networks of systems, will require data and alerts from every pumping event, so +Pump factory default will track and tag all events. Owners/Sponsors requiring a setting other than Factory Default should call (844-935-5426) or email the Wellntel Team (info@wellntel.com) and the change will be made remotely. Customers not yet running sensor firmware V2.0 or later, or who are unsure of the firmware they have, should contact Wellntel to arrange for review and possible upgrade. Customers running older firmware should upgrade in order to take advantage of these and future features. Firmware older than V2.0 will no longer be supported after July 21, 2018. Wellntel is offering a new “Factory Upgrade to Latest Everything” that includes Sensor Firmware Upgrades to enable these new Pump Influence features, a new SP3 Sounder, and a FREE Pump Performance Kit with instructions for installation. Place your upgrade order here. Posted December 6, 2017 & filed under News. At the National Groundwater Association’s 2017 Summit, Wellntel is announcing its newest, and perhaps most disruptive innovation. 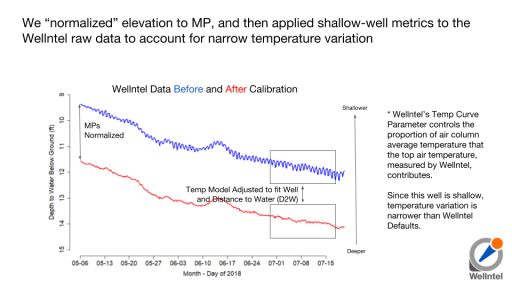 Having set new benchmarks for accuracy, simplicity, cost, scale and stakeholder engagement in groundwater monitoring since 2014, Wellntel has unveiled its newest change-making solution. Wellntel’s new Rebate Program dramatically lowers cost of ownership while also vastly increasing the amount of useful information about groundwater in an area. This new and novel rebate program addresses a sponsor’s need for regional information to make smart resource decisions and a well-owner’s need to know what’s going on in their well simply and efficiently, while still ensuring privacy, security, and a dataset of unparalleled accuracy, scale and depth. 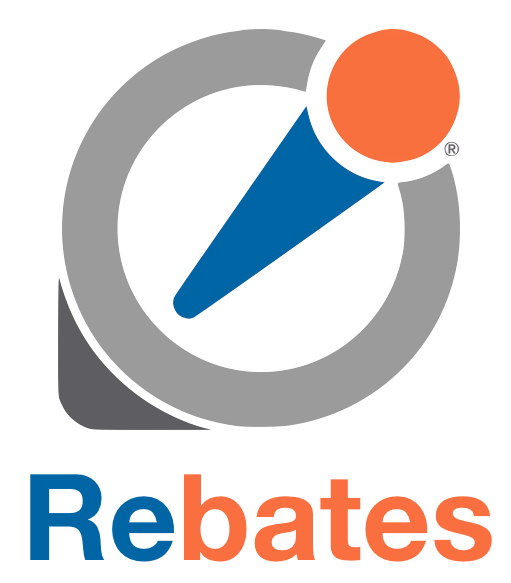 The rebate program offers buyers of self-managed systems an opportunity to realize a return on their investment that may, eventually, offset the costs to acquire and run their systems. For sponsors, a community groundwater network made from self-managed systems can come online quickly, and without tapping tight capital budgets, while providing vital information for groundwater, development, and sustainability planning that has, until now, been missing. An owner or owners invest in their own Wellntel systems, rally neighbors, build a Community Groundwater Network, and then offer information from it to area agencies, like schools, county, village or township leaders, and their natural resource consultants, who pay for data services and owners rebates, but not the equipment. A sponsor can assemble neighbors, propose a data sharing agreement and rebate term, and citizens join the network by investing in a Wellntel system and joining the local program to collect rebates to offset the cost of ownership. Wellntel’s role is to help plan a useful network that meets local goals, assist with boilerplate rebate agreements, offer systems recommendations and help finding suitable sites, ensure privacy and security, and will issue rebate checks to participating owners quarterly. Wellntel owners are invited to find our more about rebates, and if one is available in their area at this website. Sponsors are invited to contact Wellntel’s VP-Business Development, Chuck Dunning, PhD, for a direct consultation about creating a rebate program in their area. Posted November 22, 2017 & filed under Events. Neighbors, ranchers, educators, and businesses of Klickitat County in the State of Washington can work together to understand groundwater, create smart local agreements, increase social and economic resilience, and protect the land and property value. Communities that have sufficient groundwater facts can smartly balance the needs of citizens, ranches, forests, and businesses. Today, citizens in Klickitat County are coming together to ensure that these facts are available and in the public discussion. They’re doing this by creating an accurate but easy and inexpensive Community Groundwater Network. Experts will share facts about area groundwater, you can see live demonstrations of similar networks, discuss project goals, and enjoy refreshments and conversation. Who’s invited: The public/community at large and Klickitat County natural resources staff and elected officials. 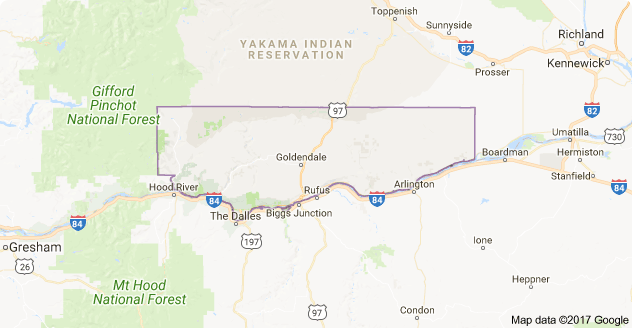 Area of focus: Areas of Klickitat County where Klickitat County staff and neighborhoods are currently monitoring well and ground water characteristics manually twice each year.